Read Bubba’s story today because you can help give him the happy ending he deserves! It is not often that a farmed animal steps out of the aggregate and becomes an individual to the public. Chickens, turkeys, cows, sheep, and the other animals who have been domesticated for human food and other uses almost always exist beyond the awareness of most consumers. All that we generally see are the products made from those many individuals—processed and packaged and renamed as “beef” or “pork” or “cheese” to create an even safer distance from the reality of torture and death behind each one. 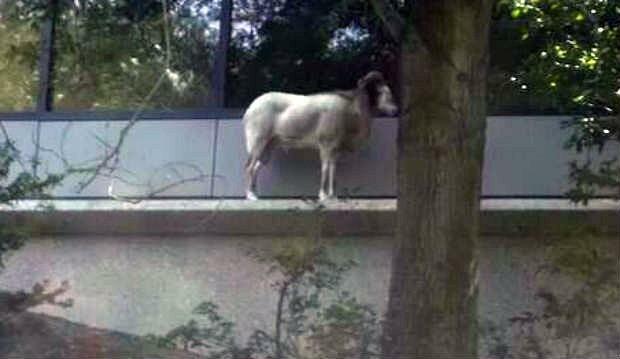 Bubba the Ram stepped out of the abstract in August 2013 when he started making appearances in yards and at businesses in Durham, North Carolina. He eluded Durham County sheriff’s deputies for nearly four months, popping up and amusing or spooking residents all the while. 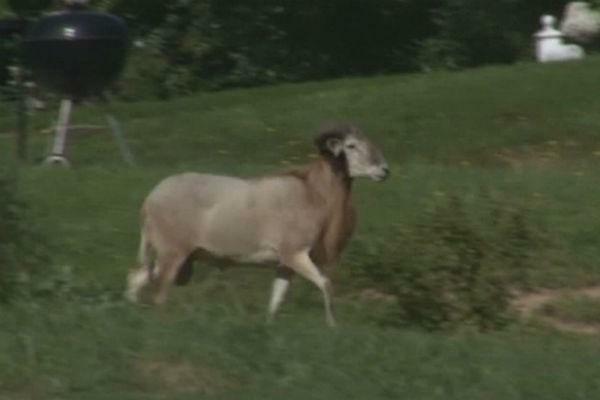 He was finally captured on December 10 after damaging windows and doors, apparently because he was head-butting his reflection—as rams are wont to do. 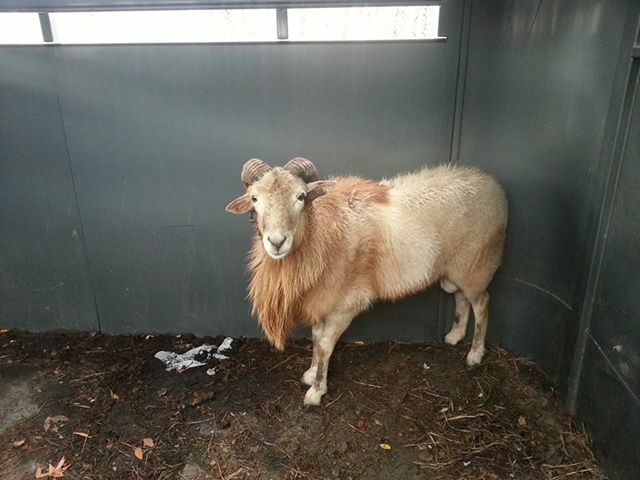 He was then taken to a local farm, where he remains today, and was treated for an ingrown horn. You might think that, as a celebrity, Bubba’s fate would be a happy one—something involving him spending his days grazing on verdant pastures, frolicking with the ewes and baaaa-ing with contentment in the warm sunshine. That is, you might start to see him as an individual, whose spunky personality and knack for thwarting his would-be captors (at least for a few months) make you feel that he deserves a better fate than the billions of other farmed animals who are raised and used and killed each year for human ends. Instead, Bubba’s fate is not certain. Like all states and the federal government, North Carolina has specific laws for “livestock” that dictate different treatment than is afforded to cats and dogs (i.e., “pets.”). Specifically, chapter 68 of North Carolina state law requires that farmed animals who come into the possession of animal control must be held for a period of thirty days—in case an owner wants to reclaim a lost animal—and then sold at auction after a twenty-day period for public notice. This means that Bubba cannot be adopted out by the Durham County shelter; he must be sold. Whereas someone who wanted to adopt a cat or dog would usually have to fill out an application and be screened, in Bubba’s case there will be a public auction in which anyone can walk in and, if they put up the most money during the bidding, take him and do as they please—including breed him or eat him. Unfortunately, Bubba’s adventure has turned into a bit of a spectacle for some people, including local media… and at least one reporter who apparently finds it hilarious that this individual being will be bid on, purchased like an object and, funniest of all, possibly made into mutton burger. Many of us who care about farmed animals are not laughing. My wife and I, along with a number of collaborators and supporters like Piedmont Farm Animal Refuge, want Bubba’s epic saga to have a truly happy ending. To make this happen, we have been raising funds so that we can rescue him from the auction. 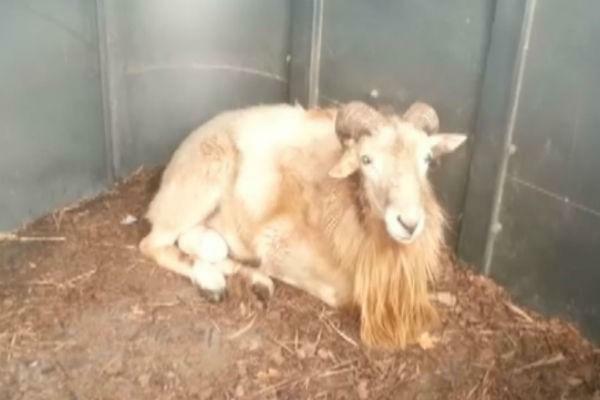 In addition, Red Dog Farm Animal Rescue Network has offered to take Bubba and ensure that he goes to a good, caring forever home—possibly with the aforementioned green pastures and happy ewes. Baaaa indeed. Our fundraising campaign on YouCaring.com will end on Wednesday, January 29, just two days before the auction at a goat farm. We are trying to raise $750, which will be used for bidding at the auction; we hope to raise even more than that, since we have no idea how many people will show up or how high they will bid to get Bubba. However much we raise, if we are able to rescue Bubba any remaining funds after the auction will go towards his vet care (including getting him neutered), food, and other expenses. Although spunky and a master of public relations, Bubba is as much an individual as any farmed animal, regardless of his or her species. We humans know that the animals used for food, clothing, medical testing, or other purposes have rich social, intellectual, and emotional lives. We can and must respect them accordingly, first and foremost by going vegan and ending our personal role in their suffering. But humans can also do more, in myriad ways. We on the Bubba rescue team are eager to help individual farmed animals like Bubba get out of the farming system and into caring homes, both by rescuing individuals when we can and (we hope) by changing the laws that require auctioning of livestock by animal-control facilities. 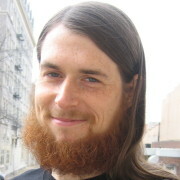 Justin, an ethical vegan since 1999, is a writer, educator, and activist. 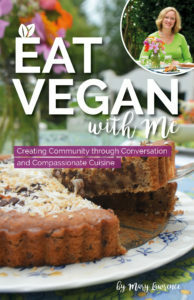 He has a PhD in English, and has done everything from start a vegan baking business (with his wife, Rosemary) to organize a big vegan community event (Vegan Night Out), to giving guided vegan shopping tours and talks on the environmental benefits of a vegan lifestyle. He lives in Chapel Hill, North Carolina with his wife and a big family of rescued furry kids. Wow. thank you so much Justin. I am just sick to learn of the ‘laws’ in North Carolina. That is utter insane cruelty — legislated. Horrible. I shared the link/story. Please please save him! God bless you and those who are trying to help him. He is so beautiful. Please update on this as well. Sending all good thoughts, light, love, prayers to get Bubba home!!!! Thanks for your kind comments, Jody. We too were sickened when we learned about the law regarding farmed animals (“livestock”) when we encountered it with a sweet little goat in another county. We have raised a good bit of money for the auction, and we are eager to get him to his new, caring home–and get him neutered and vetted! I will be sure to share updates here and on Facebook after the auction. thanks Justin!!!! will check in for updates. 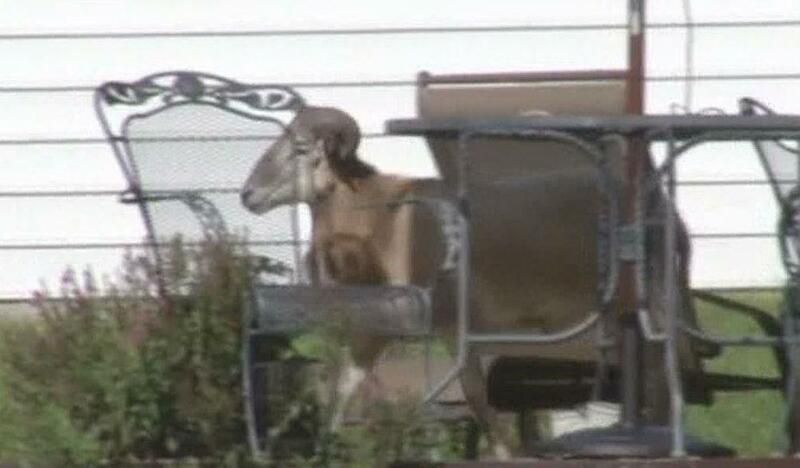 I am happy to report that Bubba the Ram has been rescued from auction and is now settling in at his foster farm. It was an exhausting day, but we are glad his rescue was successful. Funds raised were used in part for the auction, and the remainder will go to cover his neutering and additional vet expenses (he gets neutered on Tuesday!). Thanks to everyone who helped. YAAAAAAAAAY!!!!!!!!!! oh my gosh – as the page was opening, my heart was beating about a million miles a minute and I was holding my breath! THANK YOU so much Justin! If for now a “foster” home hope he will know homesweet-forever-home soon! Sweet beautiful amazing boy!! Will check back in case of updates. Will you be following his path to make sure he stays loved and safe — in case, again, that he is in a temporary place? Thank you again Justin!!!! Give Bubba lots & lots of love from here!!!! We are very happy to have him in with a rescue network that handles farmed animal adoptions, and will be carefully screening any adopters for Bubba. We will definitely be following him–even going to visit him regularly at his foster home–and we hope to be involved in any adoption process as well. I will be sure to report back with more news. Thanks for your caring and enthusiasm, Jody.